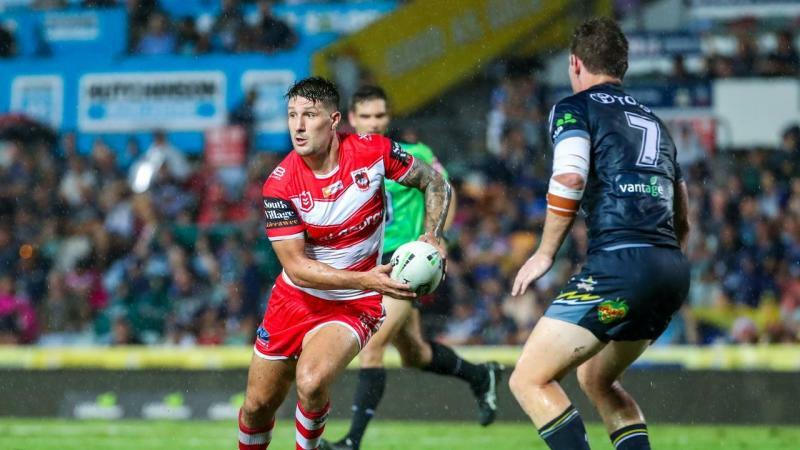 Paul McGregor wants St George Illawarra's spine to be more aggressive in attack but has no doubt they'll breathe fire for the Dragons in 2019. Clunky at times in their first-up loss to North Queensland last weekend, the Saints' all-star spine face their second big NRL test in Saturday's blockbuster against South Sydney at Kogarah. They also go into the match with just one training session under their belt this week, given their five-day turnaround included a flight from Townsville. "We probably played a little bit conservatively at times (against the Cowboys), but fatigue can do that to a team," McGregor said. "With the type of talent we've got in the spine, we need to be more excited at different stages when we've got the ball." The Dragons' spinal shift is arguably the biggest of any team this season. Gareth Widdop's move to fullback split up one of the best halves pairings - with Ben Hunt - of last season, with Corey Norman a new face at five-eighth. The plan to play Matt Dufty off the bench as a fullback and rotate the spine by keeping Widdop, Norman, Hunt and Cameron McInnes on the field is unique. Dufty was nevertheless the Dragons' most active player in the final 20 minutes against North Queensland and McGregor saw enough to believe it will work. "There are always going to be criticisms when you don't win games of footy, and it's early in the year and everyone is looking for something," McGregor said. "We're the closest to it, the guys know what they need to do ... With the ability of the three guys and their skill level and talent, they'll get it right. "He (Dufty) certainly came at the game last week. That's what a player like Duft can do, when you get tired players on the football field he can stretch the line." Spine aside, the Dragons will rely heavily on Blake Lawrie at lock in place of both Jack de Belin and Tyson Frizell against a big Rabbitohs pack. Frizell was back at Dragons training on Wednesday after surgery on a ruptured testicle, but isn't expected to return until at least round four. "As far as motors go, he's as good as any of them at training ... I'm very confident that he'll handle it," McGregor said of Lawrie. * Souths have won just eight of 30 games at Kogarah. * The Dragons have lost their past three games after playing in Townsville. * Greg Inglis needs one try to reach 150 in his career.